I soon will have our second solid black GSD. I watch televised dog shows and have never seen a solid black GSD in the shows. When looking for a solid black GSD, I frequently see that such dogs are from working lines. I don't think I've ever seen a solid black GSD listed as being from show lines. 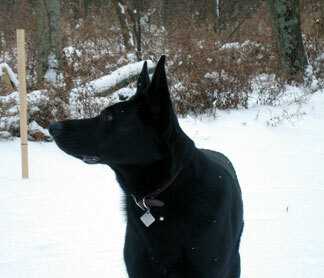 Of course, I think the solid black is the most beautiful of all dogs, not just GSDs. I know the AKC accepts solid black GSDs, but why are they not suitable for shows? Black German Shepherds can be shown in the confirmation ring too. 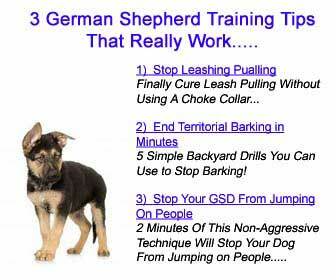 And don't let the title "working dogs" fool you because show dogs are working dogs too in their own way. "The German Shepherd Dog varies in color, and most colors are permissible. Strong rich colors are preferred. Pale, washed-out colors and blues or livers are serious faults. A white dog must be disqualified." I think you just don't see many solid black GSDs as winners in the confirmation ring (All breed shows like on TV) because there are just so many saddlebacks out there competing and they're (the black GSDs) just outnumbered. If you were to go to a German Shepherd specialty show (all GSDs competing against other GSDs - no other breeds allowed) I'm pretty sure you'd see a lot of solid black German Shepherds there. Comments for Why are most solid black GSDs listed as coming from working lines? I see black GSD's in breed only shows all over California. I have a breeder friend whose puppies are always solid black. Very striking to look at. I believe the lack of blacks appearing in the show ring is due to biase against them. In some countries sables are not common either for the same reason. This seems to trace back to the 1960's when several black and gold saddle backs in Germany were highly touted. Black and gold saddle backs were in and blacks and sables on the outer. With working lines this biase has not happened. I have Raennik Eko, Eko The Gecko, the first shown in Australia for years as a full black. He took out Baby Puppy In Working Group at Camden Show Society Inc on 20th March 2010 then on 4th April was graded "Promising" by Margit van Dorsenn of the SV at the German Shepherd Dog League Inc show. He is believed to be the first working line dog to take an In Group award and a German grading in Australia. He is also believed to be the first or one of the first all blacks to be so awarded in Australia.